I am sending all the family my prayers. Tammy and I were great friends upon meeting at softball and pretty much stayed that way. She always made me laugh and saw things in a straightforward way. She loved her family very much and was always so proud of Dougie. God must have a reason for taking someone so young, talented and beautiful. I know she is at peace with her parents and Billy now. I will always remember our fun times and other times when we helped each other out. Rest in peace Tammy and know that you were truly a unique person with a big heart. 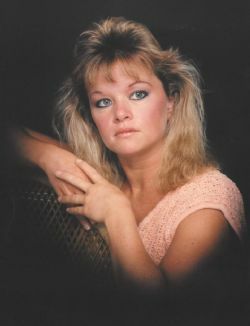 Oh Tammy, your beautiful smile and blue eyes are embedded in my memory as well as your incredible sense of humor. You made working 3rd shift in the Molding Department bearable. I'll never forget all the practical jokes we played on the MMTC's, which I know they loved the attention. Also, I really enjoyed listening to you talk about your son "Dougie" and how proud you were of him. Rest in Peace beautiful lady and may God bless your family. I am sorry to hear of the sudden loss of my cousin. Please know that her uniqueness will be missed.